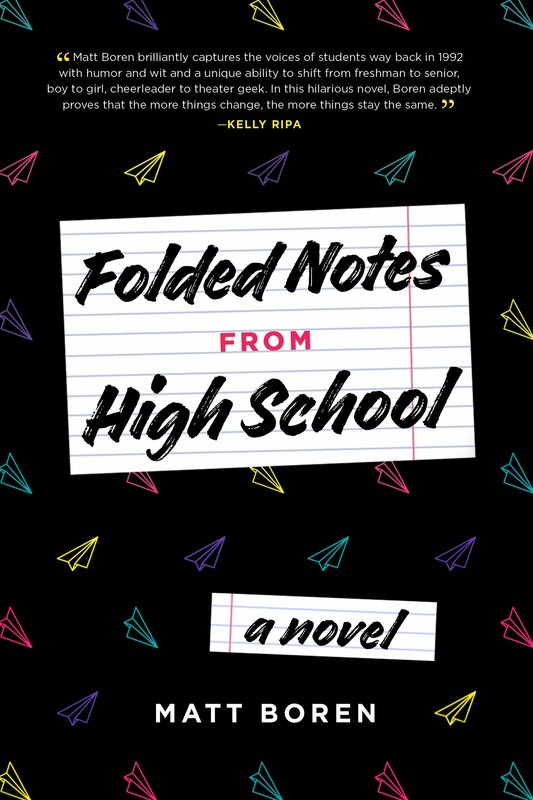 Folded Notes from High School by Matt Boren is a story about teenagers in the early 90’s. Through handwritten note format, the reader follows senior Tara Maureen Murphy, as well as her boyfriend, best friend, rival, and the freshman new kid. Boren captures the melodrama of high school in this fast-paced but shallow story. Tara is a self proclaimed star and performs in all of the drama productions. At the beginning of the year her boyfriend introduces her to his freshman neighbor, Matt, imploring that she be nice to him. Tara deigns to speak to Matt and finds he longs for a lead role in the fall musical. Tara, a condescending mentor, informs him that freshman don’t get leads. Shocked when he does, Tara eats her words. Although she has the “perfect” jock boyfriend, Tara falls for Matt. Unfortunately, her reputation is far more important than her true feelings, and she stumbles in her attempt to balance the two. Readers who remember passing folded notes will enjoy the attempted nostalgia although the book can’t fully reflect the intricacies of note passing. Folded Notes from High School misses out on the folding, doodling, and fonts that came with the medium. Due to the format, the chapters are short and pack a lot of information, making the book a fast read. The pacing is great, but the book ends suddenly, leaving the reader with questions. Tara steers the plot with her drama and schemes. While the reader will find her interesting at first, she becomes one note and predictable. Tara will do anything to get her way no matter the cost and without thinking about the consequences. She is unwilling to acknowledge her failures, even as her narcissism sours her reputation. Further into the book, her back and forth attitude may ultimately lead the reader to wonder if she has an undiagnosed mental illness. Boren crafts a fun read but ultimately creates a shallow character who doesn’t learn. The supporting characters in Folded Notes have better arcs, although the reader doesn’t get to spend much time with them. They grow up and find their place in the world, even with Tara’s maneuvering. As they distance themselves from her, Tara seems more unstable. Unfortunately, these characters blend together forcing the reader to flip to the end of the chapter to check who wrote each note before reading it. Folded Notes from High School reads like reality TV, melodramatic and catching, with a nod to the ups and downs of high school. It’s fun, despite the choppy ending. Tara is a shallow and manipulative character, but the reader won’t be able to put the book down wondering what she is going to do next. Laura R. Shank is a writer from Raleigh, North Carolina. She is currently working on her third novel, a young-adult fantasy. Since February 2016, Laura has run a weekly critique group for genre fiction writers. She is also a member of the North Carolina Writers' Network. In 2017 she launched a blog about living with depression disorder, LauraVsLaura.com. In her free time Laura enjoys weight-lifting, reading, playing board games, and traveling. 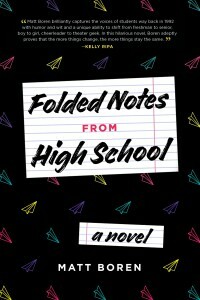 Folded Notes from High School follows a group of teenagers in the early 90’s, capturing the melodramatic ups and downs of high school.